Education is irrevocably changing in the early twenty-first century. In today’s world, issues such as environmental sustainability, human population migration, political conflict, and information technologies require thinking beyond national borders to arrive at solutions. As educators and leaders, we must prepare our students to succeed in the changing world into which they will live and work. At the same time, we are reconsidering both what we do and how we do it, for what we have understood for years in terms of content and delivery is being called into question. With challenges come opportunities. The possibilities of connecting students across the globe to work together on collaborative projects, and connecting educational institutions to deliver collaborative courses, certificates and degrees are vast in the twenty-first century institution. We can cultivate real-life opportunities that are integrated into courses and programs, that connect with local and global partners, and that embrace technology as a tool to innovative possibilities. . 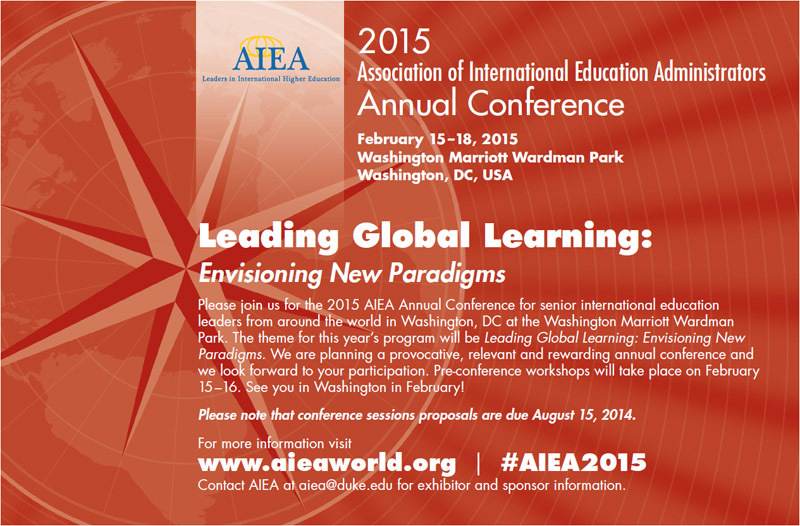 The AIEA 2014 conference emphasized the obligation to prepare students for global realities. 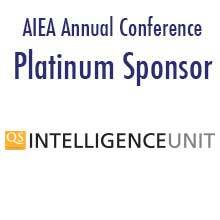 As we gather for the 2015 AIEA conference, we will continue to explore leadership implications for the future, including: How do we as international education leaders prepare our students to live in today’s diverse, complex world, and to engage successfully in the global marketplace? How can higher education institutions be accountable to local, state, and national governments and accrediting bodies with regard to global learning efforts? Who should be our collaborative partners beyond business and government? What technologies do we anticipate for the future, and how can we as leaders harness emerging technologies for meaningful internationalization? How can we facilitate students’ deeper engagement with global issues and questions in their daily lives? Above all, how do we as educators and leaders anticipate and embrace the challenges of the higher education landscape of the early twenty-first century, and prepare our students to navigate this unfamiliar topography? The Senior International Officer (SIO) and Campus Leadership: How can the SIO, in collaboration with other senior leadership, anticipate and embrace twenty-first century challenges? In what ways does or should the SIO inform and support the mission and vision of the institution? How might the SIO best direct the international office towards effective and supportive collaboration with other offices across campus? Diversity and Global Learning: How can the SIO contribute to diversity efforts? How might international and diversity offices collaborate towards a shared vision of cultivating intercultural competence? The SIO and Accountability: What is the role of the SIO with regard to institutional accreditation processes? How can the assessment of global learning efforts support other assessment, accountability, and accreditation efforts on campus? Technologically-Facilitated Global Learning: How might global learning efforts benefit from emerging technologies? In what new and exciting ways – including collaborative courses and degrees -- can institutions connect with institutions in other countries through technology to achieve goals of comprehensive internationalization? Global Responsibilities: How might the SIO encourage global learning efforts to intersect with other efforts on campus such as sustainability? What is the potential to collaborate with international partners to explore global issues?